Annotate specific areas and points of the design. Comment, give feedback and discuss changes with anyone in real time. This way you will create a pinpoint annotation. TIP: If you decide to start over - for example, select a different point - just hit ESCAPE before you CREATE ANNOTATION. 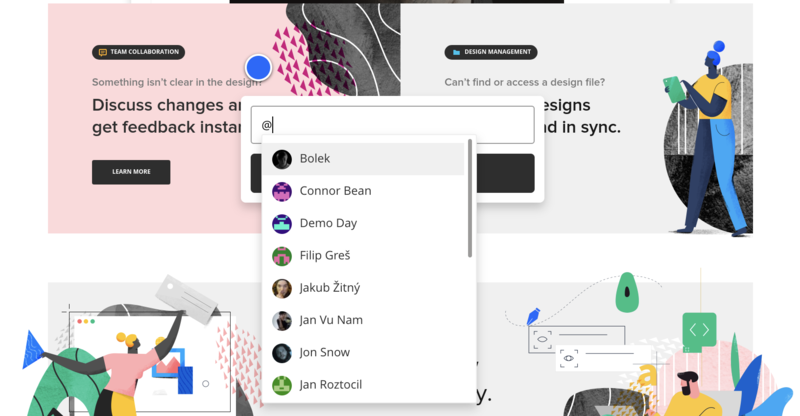 If you need to mention someone in the feedback, just use the @ symbol to search for your team members. This way you will highlight an area which you're talking about. If you need to edit what you wrote, just mouse over the text and click on Edit. To organize your annotations, you can choose from six different colors. When the change is implemented int he design, you can solve the annotation. Then it will turn grey. TIP: The annotations are always tied to a design version. This means, that when you add a new design version with a different layout, the older annotations will be still positioned as they were before. The new design version should respond to feedback from the previous design version annotations. When the suggested changes are implemented, you can either solve or delete the old annotations. You can always reopen the annotation to continue the conversation. This action will be reflected in the annotation thread. How to reply to annotations? How to remove an annotation? How to edit annotations and comments? How to mention another user?